Wystan Hugh AUDEN (1907–1973) was an English-born poet, whose world view developed from youthful rebellion to rediscovered Anglo-Catholicism. In his work Auden reconciled tradition and modernism. 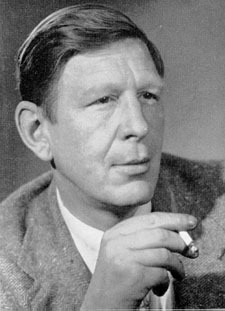 Auden is widely considered among the greatest literary figures of the 20th century. As a young man he was influenced by the poetry of Thomas Hardy and Robert Frost, as well as William Blake, Emily Dickinson, Gerard Manley Hopkins, and Old English verse. At Oxford his precocity as a poet was immediately apparent, and he formed lifelong friendships with two fellow writers, Stephen Spender and Christopher Isherwood.